I have a confession to make…I like GHOST RIDER: SPIRIT OF VENGEANCE. No, it’s not up there with the best superhero movies by any means, but it’s certainly one of the most visually interesting ones, and has the welcome addition of the manic energy and general sense of mischief that CRANK directors Mark Neveldine and Brian Taylor bring to any project they’re part of. The first GHOST RIDER, directed by the mostly untalented Mark Steven Johnson (though I’ll admit, I’m a DAREDEVIL defender) just didn’t work on any level. Tonally, it couldn’t decide whether to be super-serious and dark, or a jolly romp. You’ve got that quite distressing scene where Nicholas Cage’s Johnny Blaze burns from the inside out in a church as he transforms into his hellish alter-ego, and then you’ve got Blaze eating jelly beans out of a martini glass and giggling while watching silly videos with chimps in them. I know the best films have both light and shade, but this contrast in personality borders on schizophrenic. The effects haven’t aged well either, the sound mixing was always woolly, the love story with Eva Mendes’ Roxie wasn’t convincing and the baddies played by Wes Bentley and Peter Fonda were laughable. At least it had Sam Elliott doing an impressive impression of Sam Elliott. I’m not going to beat about the bush, Spirit of Vengeance is a riot. Neveldine and Taylor have a lot of fun with the material, not compromising on the lead character’s essential darkness, but at the same time acknowledging that Ghost Rider is just a little bit silly. There’s a welcome current of humour running through the film, and it doesn’t feel forced like in Johnson’s. They also allow Cage to be at his very best, and that is to say full-on crazy (as you would be if you were fighting an inner war with a powerful demon!). He quips, he does crazy eyes, he pees fire, he’s fun! I loved what the filmmakers did in visual terms. The character’s origins are recapped in a zippy, tongue-in-cheek graphic montage before we move on to the main event – a pretty tense and pacey chase movie with style to spare. Last time, Ghost Rider looked too clean and CG-ed. This time you really believe he’s a creature of damnation slowly burning up its host. The Rider’s biker leathers are melted and charred, the iconic flaming skull still has muscle residue, his bike is warped by intense heat, molten like it’s ridden straight out of a volcano. 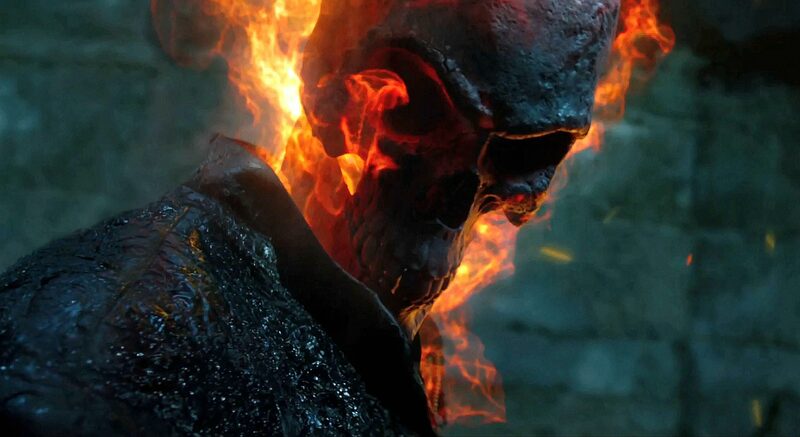 Ghost Rider looks awesome in this film. And he possesses a massive demolition vehicle and uses it to pound one of the bad guys into the ground. Religious horror film character archetypes are a good fit for Ghost Rider’s world. There’s Satan (Ciaran Hinds), the Antichrist (Fergus Riordan), a warrior monk (Idris Elba) and an evil henchman with the power to drain lifeforce from his foes (Johnny Whitworth). The characters all have a real depraved colour to them, even Hinds who hams to within an inch of his life is entertaining as he becomes increasingly irritated at his mortal form slowly breaking down around him. I know Elba’s French accent is rubbish, but who cares in a film so entertainingly trashy? This entry was posted in Film, Film Feature and tagged Brian Taylor, Ciaran Hinds, Crank, Daredevil, Eva Mendes, Fergus Riordan, Film, Ghost Rider, Gost Rider: Spirit of Vengeance, Grindhouse, Idris Elba, Johnny Whitworth, Mark Neveldine, Mark Steven Johnson, Movies, Nicholas Cage, Peter Fonda, Sam Elliott, Wes Bentley. Bookmark the permalink.